Ventilation is a system of measures to regulate the air exchange in the premises. It can be natural or mechanical. Natural ventilation is a movement of air that occurs due to the difference in pressure. In other words, natural ventilation is an air flow from an open window or door, when air moves because of the physical processes. Mechanical ventilation is created with help of the fan, which makes the air circulate in the regulated amount and in the chosen direction. Development of ventilation projects is made on the basis of supply and exhaust systems with heat recovery, regardless of the square footage and amount of air. Our team designs the project structurally and takes into account all the necessary aspects: the quantity and quality of air exchange, temperature and filtration. A high-quality ventilation system works according to the principle of fresh air intake from the outside and its supply to the premises. Before the air flow reaches the room, it has to go through the stages of filtration and cooling (if necessary). This air intake must happen through a cross-flow heat recuperator, which is installed compulsory regardless of the number of cubic meters of air in the room. Why is ventilation considered to be so important? A properly designed and installed ventilation and conditioning systems can have a beneficial effect on the general condition and state of health of a person. When breathing, a person inhales oxygen and exhales carbon dioxide. A high concentration of carbon dioxide leads to some negative effects for the body: drowsiness, lethargy, low concentration, worsening of mood and working capacity, etc. In addition, it is worth mentioning, that building materials used in construction have an ability to release some harmful substances. And namely mechanical ventilation system is meant to cope with all the problems, which we have mentioned above. Thus, improvement of the air quality has beneficial effects on the health and general condition of a person. 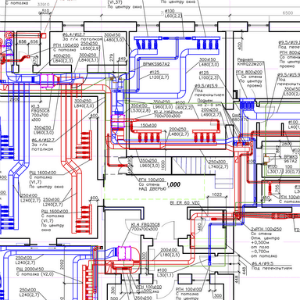 How does the process of ventilation system implementation go? The installation of the mechanical ventilation system is conducted in several stages. To begin with, our engineers contact with the customer and talk through details, including all types of ventilation systems, and offer options for each room in particular. Later, we develop the commercial proposal and adjust it, taking into account financial capacities of the client. The next stage is the design, which constitutes 10% of the total cost. When it comes to making the final offer, this 10% payment (design) is deducted from the total amount. When the finished variant is approved by both company and client, it is time to start production and purchase of all necessary materials and equipment. After this stage comes the process of installation. Despite the fact that this process is multi-stage, the time spent on installing a mechanical type ventilation system takes an average of one and a half months, which is not a long time for such an extensive work. disappearance of insomnia. Sleep becomes deep and healthy. A high-quality ventilation system is an essential aspect for achieving a favorable microclimate, which importance for the overall human state and health should not be underestimated. Any work begins with the creation of the concept. It includes a conversation with the client, during which we fully discuss the types of ventilation, equipment, energy resources and future spending. The cost and approximate concept for ducts routing are also considered. At this stage, the client already sees a big picture of the future system. For the implementation of high-quality ventilation, our team inclines towards supply and exhaust systems with heat recovery MAICO WS 320 KB and MAICO WS 470 KB, slot diffusers LOOK and air ducts made of galvanized steel covered with rubber insulator. It is worth mentioning that the isolator is designed for additional noise reduction, protection from condensation and any negative influence of external factors. All the equipment used is highly efficient, with at least 90% recovery. The system is based on a recuperator which is equipped with control automation (thus, allows to monitor all the processes with the phone using a special application, CO2 sensor, KNX module, via the MODBUS interface). Such system does not require constant monitoring, which makes the control as easy and comfortable as possible. While designing ventilation system in each room, engineers also pay special attention to aerodynamics. Correct choice of air speed, significantly affects noise characteristics. A large resistance leads to an increase in air velocity in the duct, consequently increasing the noise level, which, of course, brings additional discomfort. Therefore, we install special low-pressure systems with a minimum speed of air movement, thus increasing the efficiency of the system in general, but especially the recuperator. Linear slot diffusers LOOK are responsible for the air distribution. Airflow directions are chosen according to the minimum resistance, in order to save consumables, which, in its turn, positively affects the client’s budget. In addition to the ventilation system, we install sound attenuators in order to suppress sound decibels from the equipment. Among other components, it is also worth mentioning intake air shutoff sealed valves. When the unit is switched off, the drives must be automatically closed in order to omit cold air overpressure until the ventilation system starts its work again. To achieve effective and high-quality work, all air ducts, bends, plenum boxes must always be throttled, this, in its turn, contributes to an equal air distribution throughout the building.